My great-grandmother Anna was the youngest of 6 children who lived to adulthood. Her oldest sibling, Rebecca, was 20 years older and was married with several children before Anna reached her 5th birthday. I doubt they were particularly close, a hypothesis borne out by the fact that only one of Rebecca’s 10 children is listed in Anna’s daughter’s address books, which usually constitute a encyclopedia of relatives. This is the only picture I have of Rebecca and her husband Phillip, who rose from the ranks of English-illiterate immigrants on New York’s Lower East Side, to relative affluence in the professional ranks in Brooklyn. 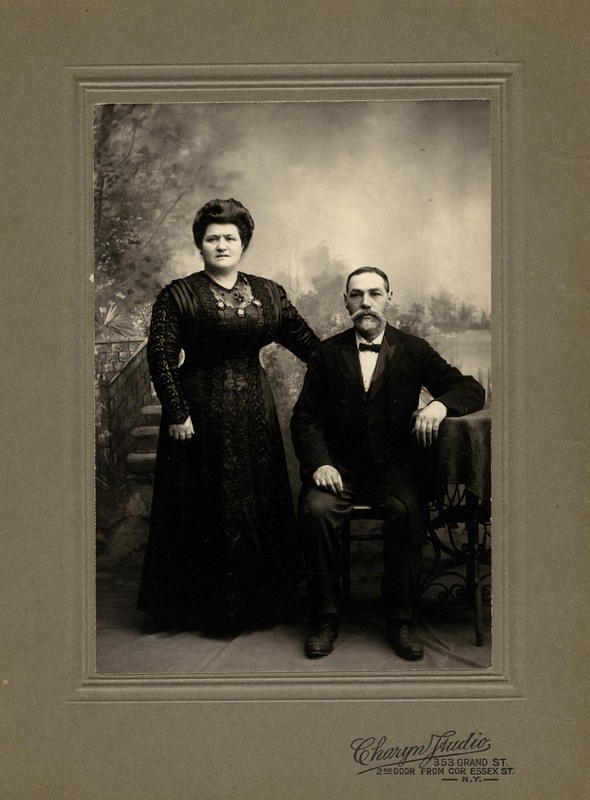 When Rebecca and Phillip married in 1880, Rebecca had been in the US since 1873, having arrived as a 14-year-old along with her mother and younger brothers (her age on the manifest was given as 11, but based on all other sources, it appears this was incorrect by several years). Rebecca came from the kind of family where in later life, her siblings (or at least my great-grandmother Anna) were unsure of their exact birthdates. Though their father was apparently far from illiterate (he is listed as a Hebrew teacher in some sources), perhaps the family was not up-to-date enough when it came to the Gregorian calendar and relied on the Jewish calendar instead. Regardless, when newlyweds Rebecca and Phillip were enumerated in the 1880 census, they were both listed as being unable to read and write in English. By 1900, Phillip could read and write in English, but Rebecca could not, though by 1910, she was listed as fully English-literate by the census taker. Whether or not this was the case, it is clear that Rebecca, a teenager when she reached the United States, never gained the educational opportunities afforded her younger siblings (especially her two US-born sisters, Sadie and Anna). Whether because he was a man or because he was ambitious and eager to move up in the world, Phillip was able to earn the language education that allowed him to become a moderately successful real estate agent in Brooklyn. As for Rebecca and Phillip as people, I know very little. Indeed, about Rebecca I know absolutely nothing. Of Phillip I know that one of his grand-daughters-in-law termed him “not a very nice man.” In this picture, he looks okay enough, though Rebecca looks less than happy or photogenic. She apparently was vain enough (or the photographer was perfectionist enough) to have her waist whittled a bit by the Charyn Studio photographer’s touch-up brush, but my knowledge of her as a personality ends with my hypotheses about this photograph. I’m Philip Rouder, born in 1952 and named after my great-grandfather. I had never before seen a picture of my great-grandparents. My 90 year old aunt remembers Philip as a dapper old gentleman, though somewhat of a rascal. Thanks for posting. Hi Philip! I’m so glad you found this post! I’ve never seen any other photos of Rebecca or Philip – but if you would like me to send you a larger version of this photo, please let me know – I would be happy to.